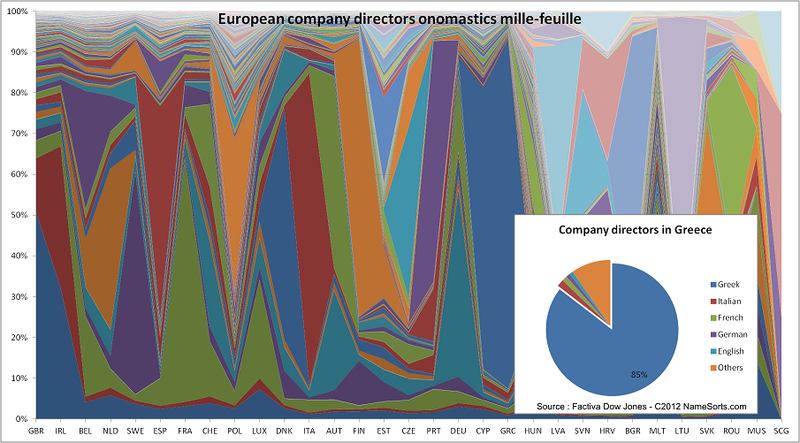 This arty colourful picture is a graphical view of the onomastics of about half a million company directors in the European Union (plus Switzerland). Only the 5K largest companies of each country were considered, so that excludes SMEs and restaurants. What does it say about European big business? Basically, that large companies in Greece (GRC) -for example- have Greek company directors, etc. Each line above the country ISO3 code corresponds to similar pie chart. Obviously, European economic integration and the mobility of European top executives are still a work in progress. In our next posts, we will highlight the benefits of onomastics to monitor Foreign Direct Investments (FDIs) in different parts of the world: Western FDIs in Africa, BRICs FDIs in Europe.